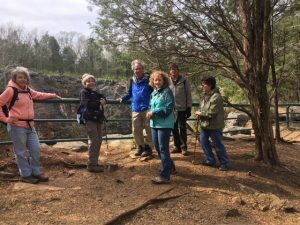 On Monday March 26, 2018, I joined a LearningQUEST hikers group (seven of us) at the Landtrust Hikers Lot on Bankhead. 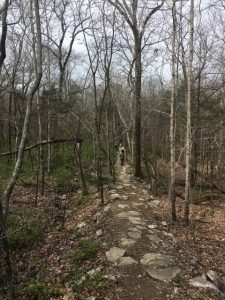 We hiked the Bluffline and Wagon Trails to the Waterline Trail and then returned on the Tollgate Trail. A wonderful 4-5-mile circuit with six new friends: Bruce Martin; Sue Campbell; Bob Schorr; Ronda Tenney; Barbara Staggs; Kathleen Haase. Our tour touched upon both human and natural history, the two being interwoven. Here my compatriots stand at the rail above the old Heritage (three caves) limestone quarry. I will keep this post somewhat abbreviated, highlighting some of the natural peculiarities we encountered and commenting on the deep human signature on the landscape. 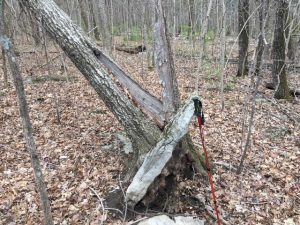 The red oak below neatly lifted a rock slab when wind snapped the tree at the base. A curiosity as much as anything, this is just one example of how nature can stimulate thought and fancy. 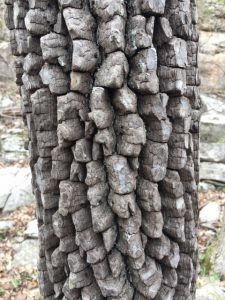 How long until decay weakens the rock/trunk union enough for gravity to return the rock to a soil-contact resting place? 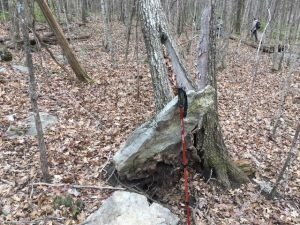 Funny how the tree “ate” the rock as its girth expanded laterally. Had the tree not been blown over, would it have eventually consumed the entire slab? 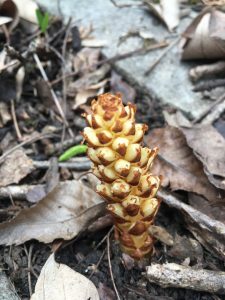 The squaw root below is the surface manifestation (the vegetative scaly-leafed structure) of an oak root parasitic plant. It will develop its reproductive, non-showy flower spike at the terminus. Again, a curiosity worthy of inspection and study… and a great photo subject. Nature never fails to astound and stimulate. 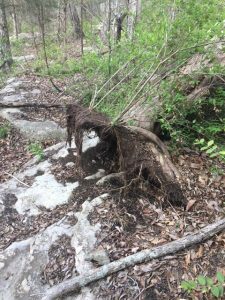 There is wonder, awe, beauty, and magic in the woods of northern Alabama, whether a mighty oak, or the parasitic plant finding purchase and nourishment on its roots. And what prehistoric beast do we have below?! A persimmon tree about eight inches in diameter with its deeply-fissured, dark grey to near-black, blocky bark. Not beauty on a Grand Canyon or Rocky Mountain scale, yet still meriting appreciation and enjoyment. 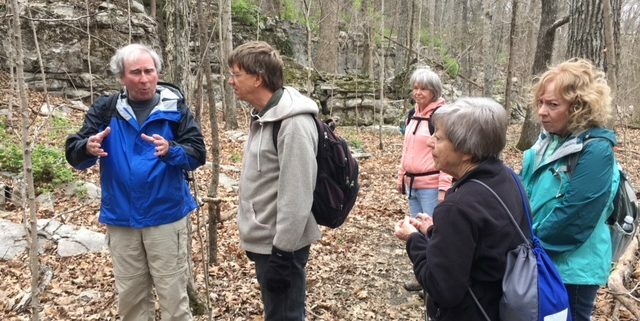 I can’t get enough of what Nature offers to an observant spring hiker. 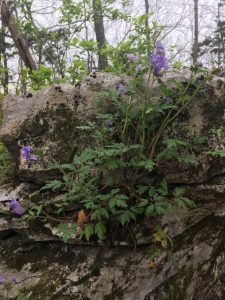 I added a new spring flower to my inventory: purple phacelia, this one clinging (and flourishing) to the vertical face of a limestone ledge. We totaled 20 species over our three-hour trek. Nothing unusual greeted us, yet each one offered beauty and reward. Likewise, each occupies a small window of time during this season prior to canopy leaf-out and forest floor shading. 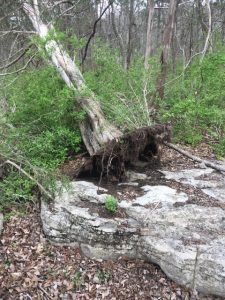 The eastern red cedar below toppled during this past winter, along with the bush honeysuckle (an aggressive invasive exotic shrub) sharing the very thin layer of soil on the limestone rock surface. We wondered how the cedar found nurture and anchorage to last as long as it did. Not surprising to see that it had yielded to the combined forces of wind and gravity. Even as Nature’s signature marks the property, this land bears the scars and evidence of human habitation, use, and manipulation over the past 150 years. Granted, Native Americans lived here for the preceding 10-12,000 years, yet left little direct and lasting evidence. Theirs was a gentler touch. As we crossed this west flank of the plateau, I observed that surface drainage has shifted over time, perhaps owing to human-disturbance. Here is a well-defined stream channel and plunge basin we crossed. Without a scale reference (I should have placed one of my colleagues on the ledge), take my word that the vertical drop from ledge to basin is about 15 feet. Yet now, even with a wet spring, this channel carries no water. The active stream is not far away. Here is another form of human touch. Bush honeysuckle (see my list of non-flattering adjectives above) has captured the understory. What has it replaced? Some spring ephemerals? Blueberry? Laurel? Other plants I find personally preferable? This foreign occupation warrants much discussion and thought. What recourse do we have? Should the Landtrust be more active in controlling it, or at least in limiting its spread? 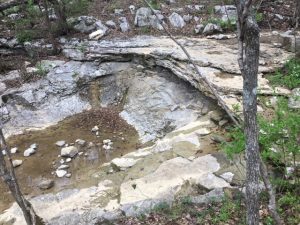 Here is the old Heritage, Three-Cave Quarry, a source of stone for the gravel (milled on-site) that first paved many of Huntsville’s early dirt streets and byways. Again, the photo provides little sense of scale except for the paved sidewalk at the bottom. I estimate that we stood nearly 100 feet above the floor. The access road exits to the photo’s bottom right. My fellow hikers indicated that the three caves (mines) extend hundreds of feet into the formation. The abandoned quarry serves seasonally as an acoustically wonderful amphitheater for concerts. I lamely suggested that it must be perfect for rock concerts! Interesting that a former industrial site now serves a public purpose as a Landtrust recreational preserve. I have said many times that we humans do not stand separate from Nature — we are one with Nature. And I hold squarely to my belief that every parcel of wildland carries a two-dimensional tale: one Nature’s Story and the other the interdependent Human Nature Legacy. The tales are intertwined… inseparable. 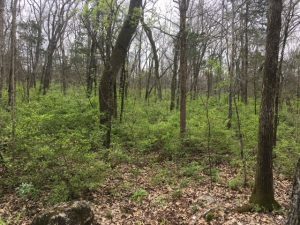 When the Monte Sano community atop the plateau took shape in the twentieth century, residents and community developers saw need for fresh water, not sufficiently available by well source. So, why not pump it up this west flank from ample aquifers below. We thus walked the old Waterline Trail (below). This is rough rocky terrain. An impossible place to lay a pipeline underground. So, the chosen solution (economic and physical) involved delineating the route and laying the pipe above ground, and then piling rock and limited soil above it. Thus, a mounded pipeline route that now provides a walking/hiking path. And, how do you get the water several hundred feet vertical? 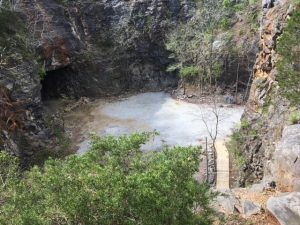 You build a pump house, find the right pump engine, and send the water up to Monte Sano. 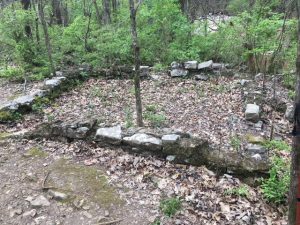 Here is the pump house stone foundation, the timbers long since decayed or burned; the actual pump sold when operations ceased. The story of land use and development is written on the landscape. I am grateful that Bruce Martin knows the history. I will seek further lessons of the human history, even as I dig deeper into understanding the human influence on the natural history. Although I took no photo, we crossed an abandoned rail line ROW on our hike. Early in our wandering we crossed an extensive midden, a long ago trash dumping site, the ground covered in broken glass and other human-originated debris. Man’s signature is etched indelibly across this preserve. All of this offers lessons that we must learn. Our touch is not and has not been light. A century ago, we took little note. Land and wildness were inexhaustible. Today, we number 7.5 billion people, who on average consume more per capita as standard of living rises, and occupy more and more of our Earth’s surface. We can no longer afford to not take note. 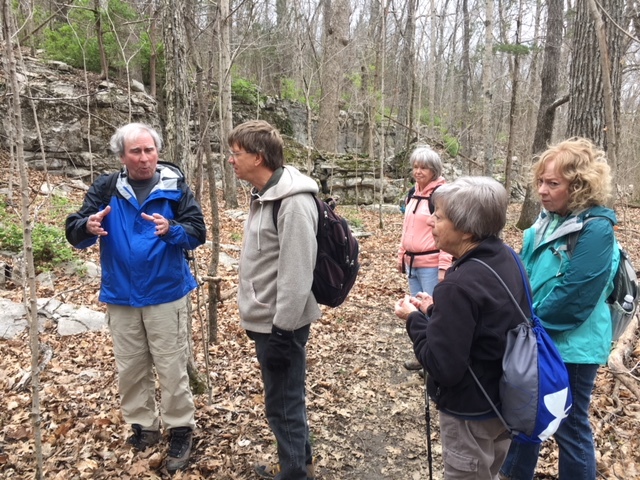 We must teach the lessons to every person who hikes these trails, making sure humanity is aware of our obligation to be informed and responsible Earth stewards. 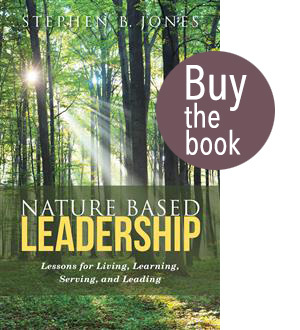 Every step on every trail offers a teachable moment. 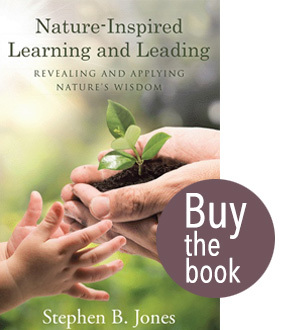 I repeat often in these blog posts that every lesson for living, learning, serving, and leading is either written indelibly in or is compellingly inspired by Nature. Are we paying attention? Will we pass the test? Am I doing all I can to spread the gospel of Earth stewardship? Are you?